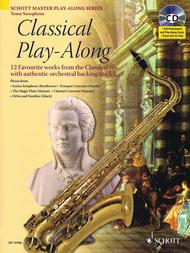 Classical Play-Along (12 Favorite Works from the Classical Era). Arranged by Artem Vassiliev. For Tenor Saxophone (Tenor Sax). Instrumental Folio. Play Along. Softcover with CD. 28 pages. Schott Music #ED13166. Published by Schott Music (HL.49017591).ISBN 1847611125. Play Along. 9x12 inches.For intermediate players, the collection includes a CD with orchestral backing tracks arranged authentically to reflect the era. Piano accompaniment parts are available on the CD/CD-ROM as high-quality, printable PDFs. Pieces include: Eroica Symphony (Beethoven) • Trumpet Concerto (Haydn) • The Magic Flute (Mozart) • Orfeo and Euridice (Gluck) • and more.